Sweet Tweet 5x11 Cellophane Bags. 100 bags per pkg. 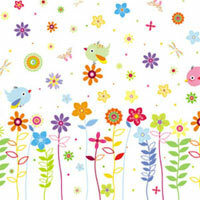 Cute little birds and flowers design. Nice print for spring! Bag background is clear. These bags are gusseted so bulky items will fit inside.